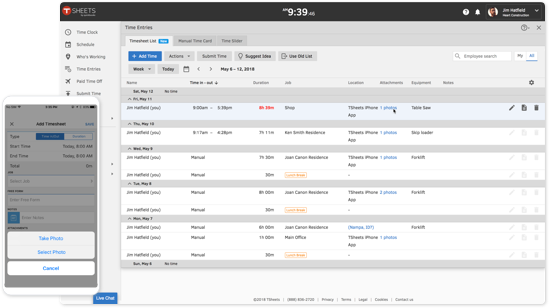 The TSheets GPS time clock collects employee locations throughout the day, and whenever employees clock in, change job codes, or add notes to their timesheets. You can see who's working and where for better job coordination. As an alternative to individuals clocking in, managers use the crew function in their TSheets app to start and stop the clock for an entire group of employees — easily track time for payroll and achieve jobsite coordination in one fell swoop. Employees can take photos of their work and attach them to their timesheets. Managers can get a better picture of each job and minimize long job updates. Clock in and out, take breaks, and switch jobs right from your phone. 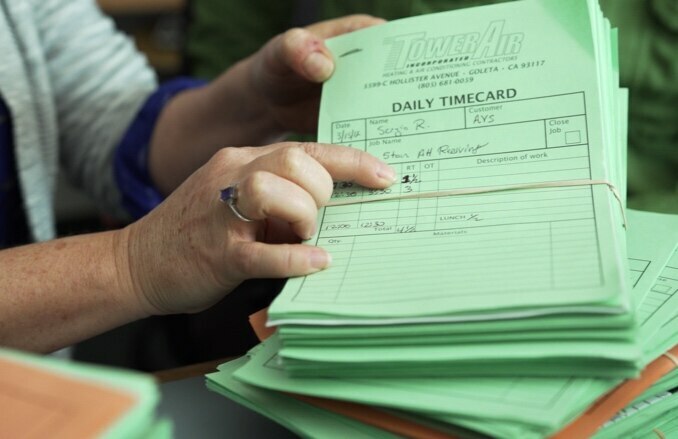 Coordinate and manage on- and off-site teams with GPS-enabled time cards. Send automatic reminders to employee phones to minimize timesheet errors. Use the mobile app to track employee paid time off, sick days, and holidays. Create, edit, and publish employee schedules anywhere. Crew managers can clock in an entire group of employees at once. Currently on the go? Sign up for TSheets on your mobile device. Have you heard? Businesses LOVE TSheets! I’ve been able to get my employees to track their time easily with the clock-in/clock-out and switch features. I struggled with other software that was clunky to use and found it difficult to get employees to track their time appropriately. With TSheets’ ease of use, getting them to track time has been simple. An amazing tool and very user-friendly. It is exactly what our company needs for a remote/mobile electronic time clock, job tracking, and on-the-fly scheduling reassignments. Thank you for developing such an efficient business asset! Employees clock in and clock out and record PTO. They no longer have to enter time worked into a spreadsheet to calculate hours. Nor does the payroll processor have to consolidate and enter the time into QuickBooks. 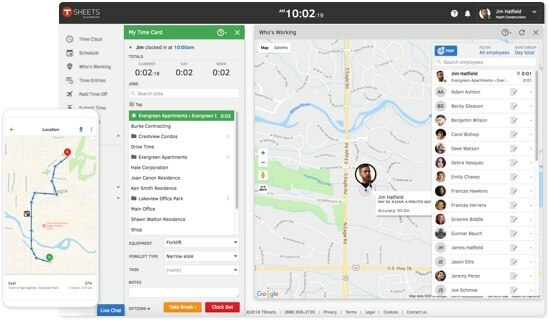 Employees can work from home and clock in/out on an app. Perfect for when the office’s power goes out—as it did yesterday! I was hesitant at first, but TSheets time tracking really is awesome! This has saved us soooo much $$ in labor costs! It’s really easy to use, and the integration to QB Desktop is seamless, as expected. Customer service is really, really good too. They are probably the happiest customer service people I’ve ever talked to! 5 stars! On average, TSheets mobile app customers use about 5MB of data per month. The TSheets app does not run continuously. The exact percentage of battery used varies by device and app use. How much storage space does TSheets use? 30MB for the Android app and 15MB for the iOS app. Storage space is affected by your role, the number of people you manage, and your permissions. *Based on a survey of 500 U.S. business owners commission by TSheets from Google Surveys in October 2017. The participants were identified independently by Google from a pre-selected audience panel.